Location: The Northborough Historical Museum is located at the intersection of Main and School Streets in Northborough, MA. Museum hours: The Museum is open to visits free of charge on Sunday afternoons from 2:00 to 4:00 p.m. during the months of May, June, September and October. Tours and private visits are by appointment, and are also free of charge. Monthly meetings: The Historical Society holds their monthly meetings on the Fourth Friday of the month from September through May at 7:30 p.m. The meetings are held in the meeting hall in the lower level of the building. Meetings are open to the public and there is no charge. 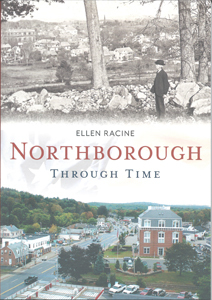 Northborough Through Time, a new "then and now" book by the Northborough Historical Society and curator Ellen Racine has been released just in time to celebrate the town's 250 anniversary in 2016. To launch the publication, a book signing will be held at the Society's building, 50 Main Street on Sunday, October 18th from 2 to 4 p.m. The Museum will be open for visits with refreshments offered in the meeting hall. This 95-page book contains some 182 photographs that cover many of the changes in town over the last 150 years. Vintage shots were selected from the Society's archive and private collections and comparable new photos were taken. Copies can be purchased by calling 508.393.2343. 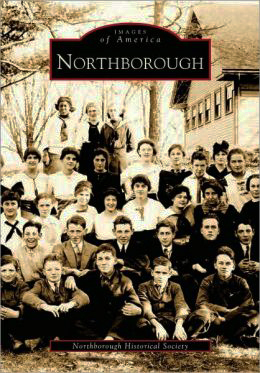 Profits benefit the Northborough Historical Society. See our Museum Shop for more book titles. 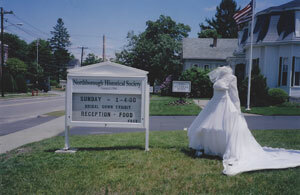 The Northborough Historical Society Building began its life as the Baptist Church when it was built in 1860. 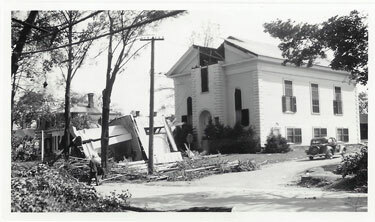 During the hurricane of 1938, the steeple came down, but the church remained intact. 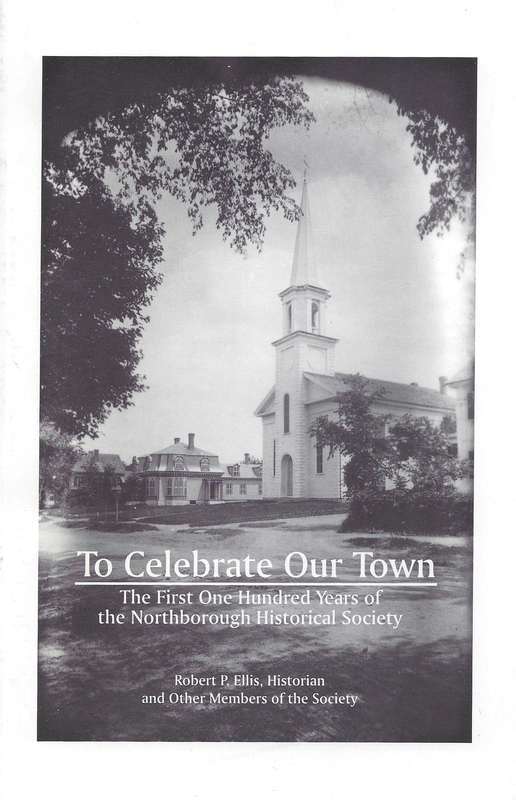 The following is an excerpt from an article written by Northborough Historical Society's Historian Robert Ellis, published in The Record on May 18, 2006, titled "Historical Society Respectful of Northboro's past. "In 1948, the Baptists joined with the Evangelical Congregationalist congregation to form Trinity Church... By the late 1950s, the old Baptist Church was on the market. At the same time, the Historical Society was looking for a home and was in fact planning to build on the old cemetery lot on Brigham Street near South Street. 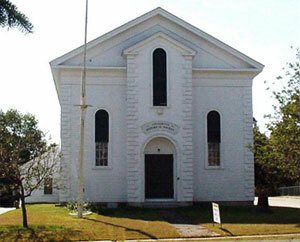 Late in 1959, however, the Society decided that the church would in many respects make a more appropriate home. For $8,000 it became the Society's headquarters; for another $500 its contents, including its organ and other valuable contents were included in the deal. "Early in 1960, a ceremony in the meeting hall marked the transfer. Old and new church members took part, the former represented by Alice Kimball, who once had been the church organist and later the president and curator of the Historical Society. "The upstairs hall, where religious services had been held, became a museum of Northboro history. The 1874 George Stevens pipe organ has been recently restored by the Andover Organ Company of Waltham. Funding has been provided by the Community Preservation Act. The flagpole that stands in the front yard of the Historical Society came from the former Hudson Street School. The Northborough Historical Society Museum has a wonderful collection within its walls. Here is a list of just some of the types of items available for the public to view. Weights and Measures: said to be the oldest in the State. We are proud of our museum's extensive collection of bridal dresses and accessories donated by present and former society members and town residents. The earliest gown in the exhibit dates to 1805 and the most recent to 1964. 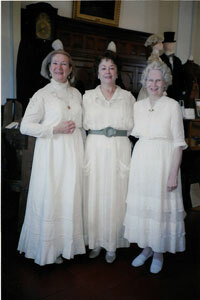 Many hours were spent by the bridal committee of Cynthia Atwood, Kathleen Pierce, Evelyn Croteau and Museum Curator Ellen Racine. This exhibit would not have been possible without their sewing ability and creative talents. A special thanks to Kathleen Pierce for writing and researching this brochure and thanks also to Lynne Derosier for her loan of a dressmaker's model. "Brides Through the Ages: 160 Years of Wedding Fashions." The following titles are available for sale at the Historical Society's Museum Shop: Contact us for availability. The Indian History of Northborough. Pease, Charles Stanley. 1980 publication of 1907 address.